Steve Perlman's on-demand service is proof of concept. et me indulge in some contortion of the maxim about cows and free milk. As the ease of broadcasting and storing data manumits entertainment media from media itself, the promise of immediate access has tempered consumers' need for ownership. 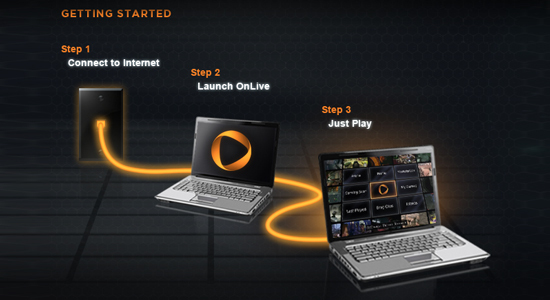 Enter OnLive, an on-demand, game-streaming service announced at E3 2009 and, in the face of delays and some incredulity, successfully launched the third week of this past June. The man behind OnLive, Steve Perlman, is the man behind Quicktime, WebTV and half a dozen other technological germs dreamt up since the mid-1980s. He has intercepted the steady advance toward relieving a network's end users of most responsibilities save for purchase and receipt. Based on a delivery structure called cloud computing, OnLive maintains servers that labor to process video games remotely; to play a selection made at button-push, customers need only possess a computer capable of streaming video and wired connection to intermediate-level broadband (or, ETA sometime soon, a branded OnLive "MicroConsole"). I chose Borderlands as my first title, and aptly, too: Gearbox Software's whirlwind opening demands top presentation. As soon as Marcus Kincaid's picture-book yarn cut to the lonesome bus route, digital artifacts became visible — but were neither distracting nor devaluing. Notably, when "Ain't No Rest for the Wicked" kicked in as a bumper kissed the skag in the road, the soundtrack lacked audible traces of compression. Was I playing Borderlands? Yes, and at little cost due to streaming. Forty dollars to enjoy the fruit of critical acclaim over the next three years while unwinding in a downtown Hilton is not unreasonable.It was Frostbyte's side-scrolling platformer-puzzler Trine, interestingly, that revealed some limits of cloud gaming. The same, minor visual degradation was apparent, but during the use of certain, likely processing-intensive animations such as the wizard's signature levitation of an arcane cube, framerate — and the notational pitch of the soundtrack! — would drop, occasionally as a detriment to play. But still, even a lavish, A-list entry like Assassin's Creed 2 performed with losses mostly confined to the subtle garbling of Ubisoft Montreal's exquisite visual design; particularly in the game's futurist-minimal menu trees. While a subscription to OnLive through its "Founding Members Program" will ultimately cost just five dollars a month, actually playing games involves a pricing structure redolent of Steam or brick-and-mortar rental stores instead of the time-constrained consumption of, say, Netflix. Unlimited access to Assassin's Creed, for example, is offered at $39.99 for what is probably the extent of Ubisoft's licensure, i.e., mid-June 2013. Five-day play of Batman: Arkham Asylum, meanwhile, goes for $5.99. Would this appeal to gamers whose computers can run most of these titles natively; or whose consoles could, no questions asked? Not nearly as much as the traveling professional whose discretionary budget includes connecting a laptop to the internet from a hotel room. Forty dollars to enjoy the fruit of critical acclaim over the next three years while unwinding in a downtown Hilton is not unreasonable. In any case, OnLive should be refining its model both in response to customers and the successive entrance of competitors. Whatever implications there are for the sheer ambition of gaming by projection remain speculative; but for onlookers who wondered if Perlman's vision had any merit, early signs affirm. It's impressive the technology works almost exactly as advertised, though their price model sounds a little troubling. When unlimited access or "buying" games cost the same as hard copies, it loses some of its appeal especially when the data isn't kept on your machine. Rental-type deals like that of Arkham Asylum or an all-inclusive subscription fee like GameTap make more sense for digital distribution. Hopefully they will be flexible with their model going forward. I would tend to agree that their pricing model needs a bit of work. In its current state, the service is a hard sell to people that already having gaming capable PC's or next gen consoles. The fact remains though that there are a lot of people out there that do not and would benefit from this service. Chris — good point. I've noted the qualifier of my home DSL speed. And James, that's a good way to put it. Promise delivered. I'd have to agree about the price model. I hope they make changes to this. As for me, it looks as if the service is only available in the US, which hopefully will expand. I am still curious about the amount of bandwidth OnLive uses. I'm aware of how much bandwidth is used to stream an HD movie, and I wonder how heavy OnLive would be on average user's monthly caps. It's the one part of the service that worries me, along with the varied visual performance.